Home » Heart Health » Can foods lower heart rate? Some people have a heart rate that is faster than normal, which can cause high blood pressure or heart failure. However, some foods can lower heart rate and are being recommended more often to those whose heartbeat is rapid. High heart rate is a condition that is rising among North Americans. When a person’s heartbeat is unexpectedly high, it is called tachycardia. A normal heartbeat count for an adult is about 60 to 100 beats per minute. A heartbeat that goes above 100 can lead to heart complications. A high heartbeat rate increases the risk of heart attack and stroke. While medications have traditionally been used to treat tachycardia, in recent years, doctors have realized the power of certain foods in helping to keep heart rate under control naturally. When people think about how to reduce heart rate naturally, they consider exercise and dieting, such as cutting down on sugar and fried, fatty foods. However, the idea that there are specific foods that lower your heart rate comes as a surprise to many. Research shows that there really are many foods that lower heart rate, including those outlined in the comprehensive list below. Omega-3 fatty acids: Some foods and vegetable oils contain omega-3 called alpha-linolenic acid or ALA. Increased intake of fish has been linked to significantly lower heart rate, according to a 2012 report in Frontiers in Physiology. Trout, herring, and whitefish are top sources of EPA and DHA, the two forms of omega-3 in fish. Fiber: Dietary fiber helps keep triglycerides under control. Triglycerides may raise your heart rate. Foods such as whole grains, beans, oats, and certain vegetables have significant fiber. Minerals: Making sure your diet includes foods that are rich in magnesium and calcium can help regulate your heart rate. Calcium makes muscles contract and magnesium can help them relax. Foods to protect blood vessels: When it comes to how to lower heart rate, blood vessel health must be considered. High blood pressure damages arteries and too much cholesterol stick to damaged areas. As a result, blood vessels narrow and harden, but keeping sodium intake under 2,300 milligrams daily and getting 4,700 milligrams of potassium from foods such as prunes, bananas, and spinach can help protect the blood vessels. Tofu: This alternative to cottage cheese is rich in calcium and vitamins, and is considered heart healthy. It is a good option for people who are trying to lose weight. Raisins: This snack is rich in potassium and low in sodium. Raisins can be consumed on their own or added to cereals, oatmeal, or even salads. Almonds: Rich in antioxidants, almonds also have vitamins that can help lower bad cholesterol levels and protect the heart. Many people report that almonds control their food cravings. Pumpkin: This food is rich in magnesium and can help reduce heart rate. Pumpkin puree can be added to soups or smoothies. Fish: Tuna, salmon, mackerel, and sardines are rich in Omega-3 fatty acids. Studies show that they are among the best fish choices in terms of being effective for lowering heart rate. Garlic: It is thought to prevent blockage by reducing bad cholesterol levels. Garlic contains antioxidants that can flush free radicals from the body. Low-fat dairy: The American Journal of Clinical Nutrition reports that low-fat milk products can improve overall heart health and lower heart rate. Low-fat cheese and yogurt are good options. Vegetables: Research conducted at several universities, including the University of Georgia, indicates that plenty of vegetables and little to no meat is linked to significantly lower rates of heart disease, as well as lower resting heart rate. Egg whites: The cholesterol in eggs is in the yolk, so using egg whites is a healthier option. 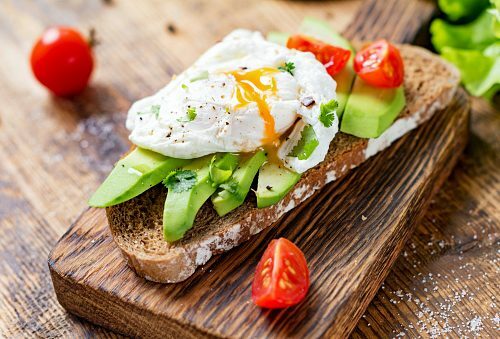 The egg white is still high in protein but is a low-fat, low-calorie food. Salmon: Studies show that the large amounts of omega-3 fatty acids in fish like salmon can lower the risk of irregular heartbeat and plaque build-up in arteries. The American Heart Association recommends eating such fish at least twice a week. Oatmeal: This food is very high in soluble fiber, which enables it to help lower cholesterol. It acts like a sponge and soaks up the cholesterol so it can be eliminated from the body. Instant oatmeal should be avoided though because it contains a lot of sugar. Dark chocolate: Studies now seem to suggest that dark chocolate has heart health benefits. This only applies to dark chocolate that has 60 to 70 percent cocoa. It contains flavonoids, which may help lower blood pressure. Soy: Food products with a soy base, such as soymilk, can add protein to the diet without any unhealthy fats and cholesterol. Soy products also contain healthy fats, vitamins, and minerals. Some research indicates that soy may reduce blood pressure in people who eat a diet that is high in refined carbohydrates. Potatoes: As long as they aren’t deep fried, you can eat potatoes without worrying. Potatoes are rich in potassium, which can help lower blood pressure. They are also high in fiber. Legumes: Beans, lentils, and peas are all a good source of protein yet they don’t have any unhealthy fat. Legumes have been known to control blood sugar in people who suffer from diabetes. Lowering blood sugar is important if you have diabetes and want to avoid complications, such as heart disease. Extra-virgin olive oil: People who are at high risk for heart disease and who follow a Mediterranean diet, along with at least four tablespoons of olive oil, have been able to reduce their risk of heart attacks, strokes, and dying by 30 percent. Broccoli, spinach, and kale: Research suggests that greens may give us an extra boost when it comes to our heart health. They are high in antioxidants, fiber, vitamins, and minerals. Did you know that kale also has some omega-3 fatty acids? Kale is a green vegetable that has experienced a surge in popularity recently. Flax seeds: These tiny seeds along with the now popular chia seeds are high in omega-3 fatty acids, which make them good for heart health. One of the great things about flax seeds and chia seeds is that you can add them to all sorts of dishes. In other words, it is pretty easy to incorporate the seeds into your diet. There are also fruits worth considering when it comes to lowering heart rate naturally. For instance, although many people see it as a vegetable, the avocado is a fruit and it has a reputation for providing the heart with healthy fats. It is rich in monounsaturated fats that may lower heart disease risk factors, including cholesterol. The avocado is also high in potassium and antioxidants. It can be added to salads, spread on toast, and is the main ingredient in the popular dip guacamole. The list below covers other fruits that lower heart rate. Bananas: Very rich in potassium, the banana is thought to be a very effective fruit for lowering high heartbeat. Bananas are considered an easy fruit to include in the diet because it can be added to cereals, oatmeal, and baked goods. Some people freeze bananas and add them to smoothies later. Blueberries: A 2013 study involving women between the age of 25 and 42 who consumed more than three servings of blueberries and strawberries a week showed a 32 percent lower risk of heart attack. It is believed the berries’ benefit comes from flavonoids that may help lower blood pressure. Citrus fruits: These fruits have flavonoids and are high in vitamin C, which has been linked to lower risk of heart disease. It is important to keep in mind that grapefruit can interfere with cholesterol-lowering drugs called statins. Tomatoes: High in potassium, the tomato is also a good source of lycopene. Lycopene may be able to reduce bad cholesterol, keep blood vessels open, and lower the risk of heart attack. Tomatoes are low in sugar as well. Pomegranate: This fruit contains many antioxidants, such as heart-promoting polyphenols, which may help reduce the risk of hardening of the arteries. Certain beverages can also assist in lowering heart rate. Red wine in small amounts is thought to lower heart disease, milk is rich in calcium and calcium deficiency is one of the major causes of high heart rate; green tea has been associated with reduced risk of cardiovascular disease and stroke; and some studies suggest that just two cups of coffee per day can lower risk of cardiovascular disease. A word of caution: we are not suggesting you start drinking lots of red wine and coffee, but adding a glass to your diet every once in a while wouldn’t hurt. Foods can be a powerful tool when it comes to our heart health. This is not to say that other treatments are never required. In some cases, heart patients find that a combination of exercise, traditional treatment, and natural treatment is required to keep their heart beating at a normal rate.